The band name was curious enough to spark some interest, Blue Moon Harem. But the album title, Finland, and artistically challenged album art raised more than a little suspicions. The old adage rings true: you can't judge a book by it's cover. Within Finland are 11 songs of fine American AOR melodic rock. Remarkable from the start is the breadth and strength of Jonathon Bix's vocal presence, but also the arrangements and partner Demetri Joannou's versatile guitar work. Add to this the fine production and you have crisp, clear, and interesting collection of tunes. There's some lighter fare here as Finland begins with Stay, a melodic rock song with a bit Westcoast feel. The album rounds out with three songs on the softer side, with I See Red a witness to the passion and power of Bix's voice. But, BMH also has an edgier, sometimes heavier, side that caught these ears by surprise (by comparison). Some of that edge is felt early in the second cut, Give and Take. 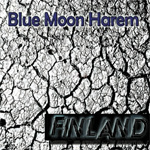 However, Blue Moon Harem gets their rock on with Inside Out, Finland, and the edgier Shadows, easily my favorite track. It also displays some of Joannou's best fret work. While the later light closing stuff was interesting, it seem fundamentally tame, even mundane. The gritty rock side of Blue Moon Harem really grabbed and held my interest. Overall, however, with this contrasting mixture of lighter with heavier material, Finland shows their dexterity and creativity in delivering sound and entertaining melodic rock. Recommended. With the contrasting mixture of lighter with heavier material, Blue Moon Harem's Finland shows their dexterity and creativity in delivering sound and entertaining melodic rock. Recommended.